I have been playing with using the Kenwood TH-D72 as a standalone digipeater and fired up the FoxTrak APRS tracker I built last year. The FoxTrak is a TinyTrak clone using DK7IN firmware. I had not noticed a problem before when using a TNC connected to PC software, but now I found that the D72 will not display the FoxTrak's packets. Instead, it interrupts the frequency display and puts >F G4ILO-12 on the first line of the display. The packets are digipeated but they don't appear in the radio's list of received stations. I'm guessing that >F is some sort of error status but it is not listed on page APRS-3 of the user manual where the other status indicators are listed. Does anyone know what it means, or how to configure the FoxTrak so that the Kenwood will display the beacons? It has been yet another fabulous summer day here in Cumbria. I'm in good spirits and physically feeling fitter by the day. I think the balance issues and "jelly legs" are more an effect of the brain operation than a lack of fitness. Perhaps the same reason my hands often shake badly and cause frustration when trying to attempt soldering. We decided to go for a walk over the fields to the north of Cockermouth and have a picnic lunch. I took the Taiwanese twins in the hope of making a few radio contacts whilst we were out. The walk involved some gentle climbing up from the valley. On the way I heard Alan M1EYO/P call on 2m to activate the SOTA summit of Watch Hill G/LD-054 which is almost literally in my back yard. You can see it on the far left of the picture behind me. When I was fit I could walk to Watch Hill though I never did as there was not much attraction in walking for an hour and a half to reach the summit when I could park the car within 15 minutes walk of the top. With no car unfortunately even Watch Hill is out of bounds. After I worked Alan we carried on walking until we almost reached the Carlisle road, where we found a grassy south facing slope to have lunch. This is probably the only portable site that I can reach on foot from here, though it isn't a very good site as it is still within the Derwent valley or "Cockermouth black hole" as I call it. Checking 2m from time to time with a 5/8 telescopic whip on the 2m radio I heard Richard G1JTD/P activating Illgill Head G/LD-029. With a bit of help from Tony G1OAE Richard heard me and we made a contact. I had to use the monitor button to disable the fixed squelch on the H112PLUS which is set far too high. The receiver on the 5/8 telescopic seemed quite poor possibly due to intermodulation or overload. These really are terrible radios! 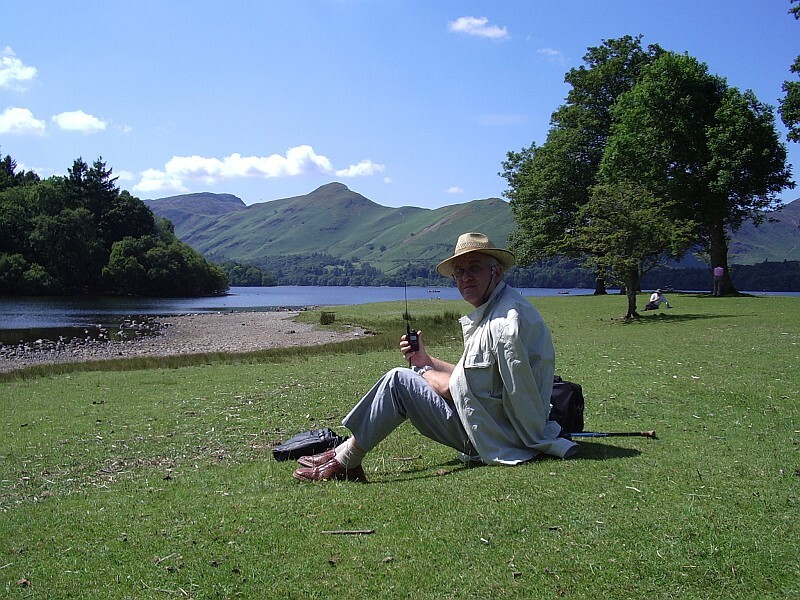 Alan was going to activate Binsey G/LD-041 a favourite of mine which was in fact the last summit I activated so we waited until he called on 2m and I had another contact. Alan told me he had discovered Rob G4RQJ on the other side of Binsey summit working 40m and setting up to try 4m. I pricked up my ears at the mention of four metres and about a minute later I heard Rob calling on the other H112PLUS so I was able to make my second-ever contact on 70MHz. Binsey is also line of sight from where I was so it was not a DX contact but it was still nice to make a contact on the 4m band. After that we packed up and walked home. It was a pretty tiring day's outing for me, definitely the furthest I have walked and the highest I have climbed since my operation. But it was quite a morale booster to get out on such a nice day and do some portable operation. There are even some trees there I could try to get some wire over for some HF operation with the FT-817 in the future, so that's something to look forward to. In a comment to one of my posts on my other blog, Roger G3XBM wondered whether exposure to materials used in electronic construction such as PVC, lead solder, flux etc. might have contributed to my having a malignant brain tumour. 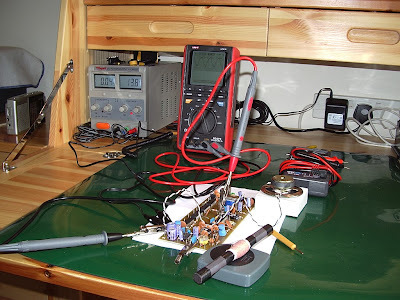 I have never worked in the electronics industry and it was mainly during my teens and in the last few years that I have melted solder to any great extent. I suspect my exposure has been quite a lot less than that of professional engineers and many other hams, so personally I doubt this is the cause, though I guess it could be one of those things like smoking and lung cancer where if you've done it at all you increase the risk. The other thing Roger mentioned was exposure to RF. This was something I kept on thinking about during the days I was in the hospital bed staring at the ceiling. Could using antennas in the attic a few feet from my head have caused the tumour to develop? Or perhaps it was using hand-held VHF radios? With the logic of the ignorant I was inclined to dismiss the fears. I have never been a particularly prolific operator and only in the last couple of years have I run more than 10 watts to my attic antennas. I suppose my liking for digital modes may have increased the strength of the RF fields I was subjected to. 40W of PSK31 is probably a more intense exposure than 100W PEP of SSB. As a right-handed person my HTs are usually held on the right hand side of my face - the side the tumour was. Coincidence or not? On the other hand, most people on the planet use mobile phones far more than I do and they aren't all dying of brain tumours. Would doctors use radio waves to kill cancerous tumours if exposure to RF caused them? I don't know. Mike G4GOC found an extract of an article "Increased mortality in amateur radio operators due to lymphatic and hematopoietic malignancies" which appears to suggest a link between RF exposure and myeloid leukemia. So I guess getting as much distance between yourself and a transmitting antenna is always going to be a good idea, hard though that is to achieve for people living on postage stamp sized plots like so many of us on this small island. 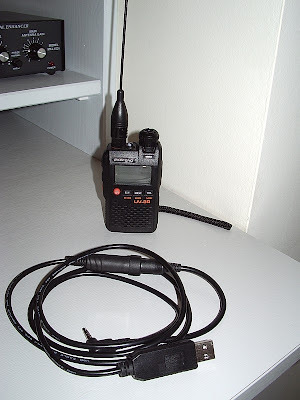 There may be no proof that anything I did in pursuit of my hobby contributed to this brain tumour, but ever since returning home and getting some of my interest in ham radio back again I have felt uneasy about being close to an RF field. Yesterday I took the K3/100 and the Kenwood 50W 2m rig off the shack desk and put them away. Perhaps I'll have a change of heart but it's going to be QRP for me right now. If I could go back in my life and do anything different that would have avoided getting this brain tumour I would do so. I just don't know for sure that carrying on as I did before won't harm my chances of beating the bugger or at least keeping it at bay for a while longer. One of the things I had intended to do this year was install the external frequency reference module in my Elecraft K3 in order to get the best possible frequency accuracy for digital modes. To this end I had ordered an Off-Air Frequency Standard (OAFS) kit from Spectrum Communications so as to avoid wearing out my rubidium frequency standard. I had completed populating the OAFS board a couple of weeks before I ended up in hospital. So I thought I would try to see if it worked, as that would simply involve connecting up a speaker, ferrite rod antenna and power supply. It began to look as if the predictions of the couple of people who commented or emailed when I first posted about the OAFS were going to be right. I could hear BBC Radio 4 long wave in the loudspeaker but it was very weak, presumably (as I had been advised) due to North Cumbria being a poor location to receive the transmission. When I checked the frequency of the phase locked loop it remained steadfastly on 216.4kHz regardless of the setting of the trimpot. The instructions supplied with the kit suggested that it might be necessary to change a resistor value if the loop will not lock on to 198kHz so I wrote to Tony Nailer at Spectrum to see if he had a suggestion. Unfortunately his reply was that if the loop will not change frequency with the pot there must be a solder bridge or other assembly error. I checked my soldering as best I could and re-did any joints that looked suspect but the way my eyes are now any sort of cross checking between the schematic and the circuit board to look for errors is impossible. I haven't really figured out what is wrong with my eyes but it is as if they no longer have the ability to vary focus. I can only see clearly what is at the exact focal point of whatever spectacles I am wearing. When something is out of focus my head swims and I have to close my eyes for a few minutes to steady it again. So any sort of constructional work now is well-nigh impossible. Tony offered to get the OAFS working for me for a fee if I sent it to him, but at this point I think it would be a waste of money. I can't see myself installing the frequency reference boards in my K3 now even if I still had the same interest in doing so. So I think the OAFS is destined for the G4ILO junkbox. One of my plans for this year had been to try other bands when out activating on the fells. I was going to try 4 metres. 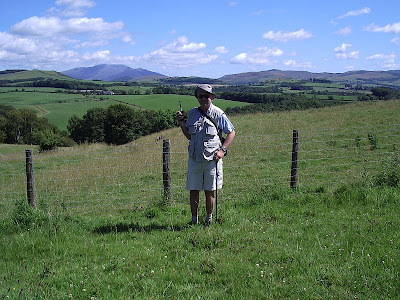 Many SOTA activators use 4m FM already and the introduction of new hand-held 4m radios from Wouxun seemed likely to cause a surge of interest in the band. Moreover, 70MHz offered the prospect of chance long distance Sporadic-E contacts during the summer months which has always been one of my main interests. I decided not to get one of the new Wouxun radios, however. Whilst the new 4m/2m dual bander looked tempting, I didn't need another hand-held with 2m capability and any dual band antenna would be an undesirable compromise. The single band 4m Wouxun was almost the same price as the dual bander, so was not a good deal. Instead, I had a look to see if I could find something like a low band version of the Motorola GP300. I couldn't, but eBay turned up a professional radio called the H112PLUS made by Cybercom Electronic Corporation Limited in Taiwan, available in VHF low band, high band and UHF versions for just over £50 shipped. A particular attraction was that the radio claimed to conform to IP54 weatherproofing specifications - useful when operating from rainy fell-tops. Unlike stuff from Hong Kong or China, the "expedited shipping" method used to send the radio attracted the attention of UK Customs so delivery was delayed by over a week and I had to pay an additional £25 tax and ParcelForce collection fee to receive it. On opening the box I was extremely impressed with the very high quality of the product. This was one of the most beautifully made hand-held radios I had seen. As far as build quality is concerned this is the opposite end of the spectrum from the little Baofeng. However the little Chinese radio is miles ahead when it comes to usability and performance. The H112PLUS is about the same size and weight as the Kenwood TH-D72 so it is one of the chunkier hand-helds. Programming software, cable and a desk charger are included in the price. So to the shortcomings. The knob on the top is a rotary control marked Vol/Ch but in fact it only controls the volume in discrete steps. Most of the time when you turn it, nothing happens. It is as if the CPU in the radio is asleep and doesn't notice you operating the controls for a while. The buttons on the front panel, which are used to change channel and access menu functions, are also a bit laggy in operation. If you try to hurry the radio, the firmware locks up and you have to pull the battery pack. The programming software is also a bit flaky and locks the radio after writing to it, requiring another battery pull. By the time I received the low band radio I was awaiting an appointment for a scan for my as yet undiagnosed brain tumour and was a bit anxious. I was wondering if I would ever make a 4m contact and so, rather stupidly but with the aim of having something to look forward to I ordered a second, high band version to use on 2m. This arrived after I was out of hospital and attracted a £30 tax and collection fee despite being exactly the same price. The high band version suffers exactly the same shortcomings as the low band one but as it covers the 2m band I was able to try it out. The main problem I noticed is that it has probably the worst receive audio of any hand-held I have used. There is a compression option which appears to clip the audio and make it sound like those police radios but even with this off the audio is still quite distorted and the actual volume from the speaker is not all that loud. The little UV-3R is much louder and sounds much better! The programming software allows you to set power level (high/low power) frequency and CTCSS/DCS tone so you can access repeaters. There is no 1750Hz tone burst, of course, and no option I can find for setting the squelch threshold. There are scrambler options that are no use on the ham bands. I then discovered a bug. If you program separate transmit and receive frequencies (as for a repeater) and then save the results as a file, when you load the saved file the frequency splits are lost. The developer has acknowledged the bug and has promised a new version of the programming software. 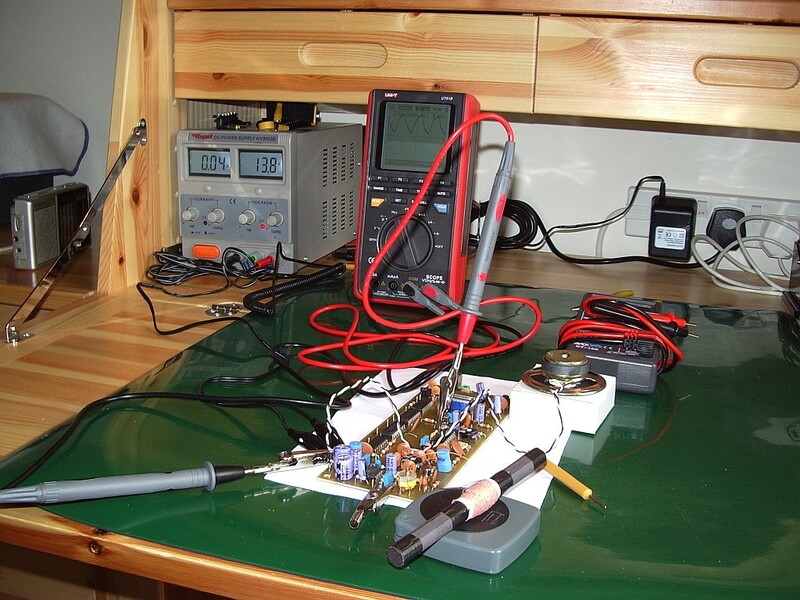 The output power is about 5W on the low band radio and 6W from the high band one. The battery pack is NiMH and rated at 1500mAh. Someone has told me it is identical to one made by Kenwood. Battery endurance, even on standby, is not great. When ordering the low band model you are given the option of specifying one of two frequencies for the helical antenna. I chose 69MHz. On the antenna analyzer the best SWR coincided exactly with 70.45MHz, which was rather nice. However the ERP from the helical is about 5dB down on a telescopic whip. The high band radio comes with a short helical that is resonant on 150MHz, but you can pop the cap off and add a few turns to the spring to get it down to 145MHz. The antenna socket is TNC so you need an adapter to use most other ham radio antennas. The speaker/mic two pin jack uses the Icom/Maxon standard. The radios do work. I even had a 4m contact with a Scottish contest station during VHF field day. 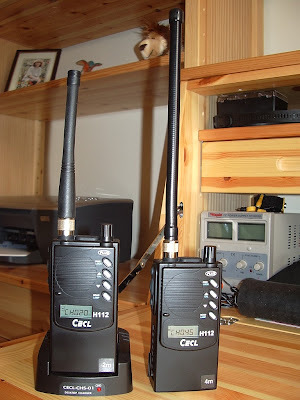 Given my health situation I have not had the opportunity to test these radios out in the field with good external antennas to see how they stand up to the high levels of signals encountered on hilltops. However, I attempted to reproduce the test I carried out in the Handheld receiver blocking shootout and the 2m H112PLUS was as bad as the poorest receiver I tested. The received repeater signal cut out when a signal at the bottom of the 2m band was keyed up, when most other radios under the same conditions showed little or no desensing. Overall I think the H112PLUS is a radio that is of more interest to collectors than someone wanting a real hand-held workhorse. It is well made and the waterproof specification is an attraction but the poor receive audio and flaky software and firmware are a big disappointment and I have doubts about the receiver's ability to handle high levels of out of band signals without desensing. The weather here ever since I was diagnosed with a brain tumour has been glorious. One of the bitterest frustrations for me has been being housebound, able to do little more than walk slowly to the shops and back instead of going for walks in the hills and activating Wainwright summits as I had planned to do. On Thursday Olga and I caught a bus into Keswick for a day out. I took along the little Baofeng UV-3R handheld in the hope of catching some SOTA or WOTA activators from the surrounding fells whilst I was there. I was pleased to make contacts with Mark MM1MPB/P and Terry G0VWP/P during the day. I love this little UV-3R radio. It's so small and light you can take it anywhere and the range of its 2 - 3W on the slim Nagoya NA-666 antenna I have put on it is amazing. It can receive broadcast radio so I can listen to Classic FM or BBC Radio 3 and if someone puts out a call on the 2m FM calling channel the music is interrupted and I can reply to them. The Baofeng is not ham band restricted so I have also programmed in the 8 license-free PMR446 channels and can use it to talk to Olga who has a little Goodmans set that I bought for a tenner on eBay. I can even dual watch between Olga's channel and 2m channel S20 so I don't miss anything. My only niggling annoyance with the Baofeng is the audio volume level, the lowest setting of which is too high so that any station using wide FM deviation - which most folk round here do - is audible to anyone within a 50m radius. There is a mod for this, which involves putting a resistor in series with the speaker, but having tried a small soldering task a few days ago and succeeded only with a lot of difficulty I think that performing the mod would be beyond me. I know from the Yahoo group that there is not much quality control on these Baofengs and one or two people have had the misfortune to receive radios that don't work correctly. But for me this has been the best thirty quid I ever spent on a bit of radio gear.